Miller High Life Beer 1956 Ad. 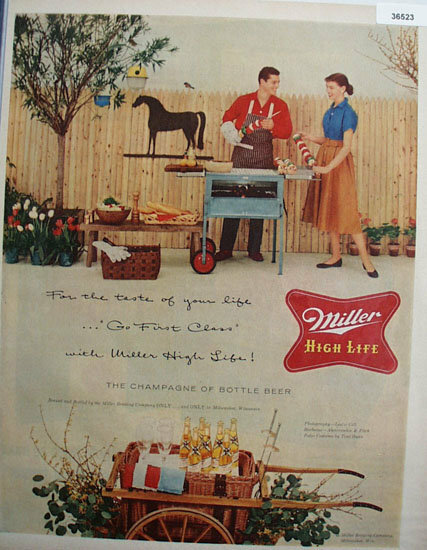 This color June 12, 1956 ad states for the taste of your life, go first class with Miller High Life. The Champagne of Bottle Beer. Picture by Leslie Gill, Barbecue by Aber Croombie and Fitch and Patio Costume by Toni Owen. Also shows man and woman making Shiskebabs on grill. Magazine tear sheet picture is taken through plastic and may show wrinkles or crookedness that is not in the ad. This Original magazine tear sheet measures 10 1/4 inches wide by 13 1/4 inches tall. Items Similar To "Miller High Life Beer 1956 Ad"
Miller High Life paper coaster.